birds : I felt much better today and so late afternoon I ventured out in the gales to see if there were any seabirds sheltering in the bays. The gales were in the wrong direction though and so it wasn't hugely likely - I had a Sandwich Tern at Jaonneuse and the first Great Crested Grebe of the winter in Grandes Havres. It was high tide though and it was very nice watching the waves crashing in. I may have been able to see some seabirds with the scope but I didn't fancy getting out of the car! moths : I noticed that the Brown-tail moth larvae must have had a good time this summer judging from the number of webs on the Blackthorn in the Jaonneuse area. The bushes there were covered. When I got home I was reading about Brown-tail moths on the interweb, and as I google-imaged the species I noticed one of my photos came up which is always nice to see. 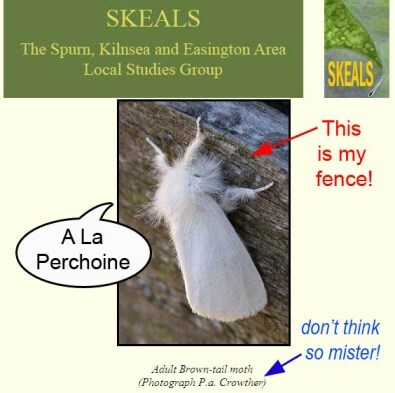 But then I didn't recognise the website name so I clicked through and discovered it was a website from the Spurn area. And I was shocked to see someone else's name below my photo! Now I don't mind anyone using any of my photos so long as they aren't making any money from it or are a private company, but to claim a photo as yours when it isn't . . . shame on you! I'll give them the benefit of the doubt and assume it is just a mistake, but I have sent an email letting them know I ain't happy!